Following a strong outing Jan. 29, Hunwick sat out another five games until Sunday afternoon, when Zach Bogosian’s lower-body injury – coach Phil Housley said he is day-to-day – pressed him into duty. Hunwick showed very few signs of rust while playing 14 minutes, 35 seconds in the Sabres’ 3-1 loss to the Winnipeg Jets inside KeyBank Center. Late in the third period, Hunwick couldn’t get the puck past the center red line, giving the Jets possession. They cycled around the zone before Blake Wheeler scored the winner with 3:55 left. Hunwick got caught on the ice for a 1:43 before Wheeler scored. Still, overall Hunwick looked solid for a veteran who has only received sporadic action. Housley liked his effort. Hunwick hadn’t played with Dahlin, 18, yet this season. He said he possibly practiced beside the youngster once. It took former Sabres prospect Justin Bailey just 10 outings with the Lehigh Valley Phantoms to earn a recall to the Philadelphia Flyers. The Flyers summoned the Williamsville native from the AHL club Sunday, 24 days after the Sabres dished him for winger Taylor Leier on Jan. 17. Bailey, 23, compiled five goals and seven points in his first weeks in Lehigh Valley. 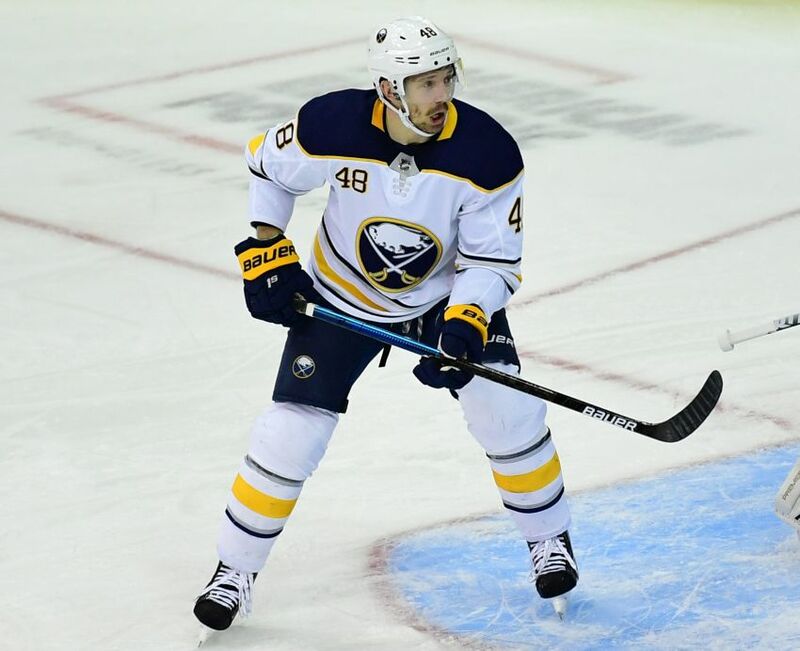 It appeared Bailey’s days in the Sabres organization would be ending when he was waived and sent to the Rochester Americans before the season. The Sabres’ current regime was Bailey’s third since Buffalo drafted him in the second round in 2013. Bailey scored five goals and eight points in 52 appearances with the Sabres. Former Sabres prospect Brendan Lemieux, a second-round pick in 2014, 31st overall, has earned regular duty with the Jets this season, compiling nine goals and 11 points in 40 games. The Sabres dished Lemieux, an agitating winger, to the Jets on Feb. 11, 2015 – four years ago today – in the blockbuster trade that brought Bogosian and winger Evander Kane to Buffalo. Two other pieces of that eight-part deal – defenseman Tyler Myers and winger Jack Roslovic – played Sunday. The Jets used the first-round pick they received to draft Roslovic 25th overall in 2015. Notes: The Sabres scratched rookie winger C.J. Smith and defenseman Nathan Beaulieu (both healthy). … The Jets scratched former Sabres defenseman Dmitry Kulikov (upper body). … The Sabres have today off.